Warning: You’re Losing Money by Not Using Driveway Interlocking! People in many parts of North America, particularly those subject to harsh winters, are losing money by not using interlocking pavers for their driveways. Snow, ice, and extreme cold temperatures cause soil upheaval. In turn, that causes sidewalks and driveways to lurch, breaking cement, shifting gravel, and ruining asphalt. Repairs and replacements from year to year add up to quite a bit of expense. 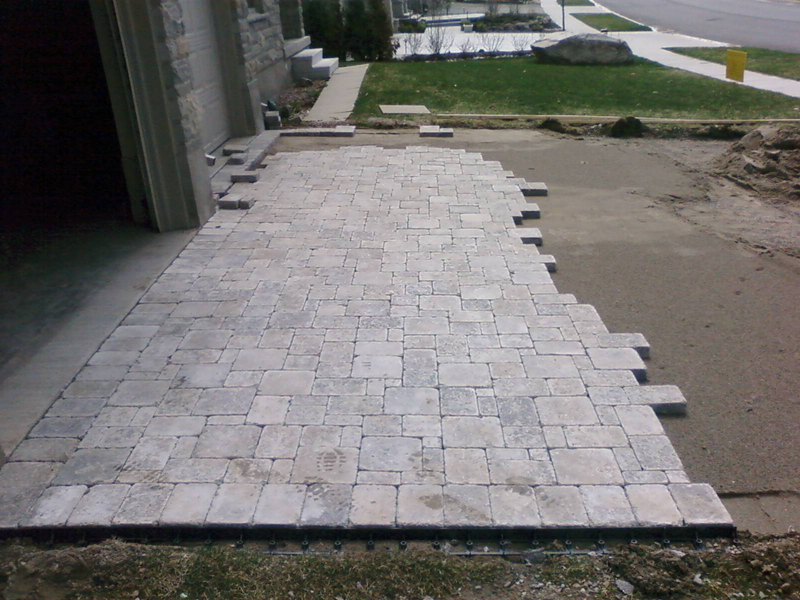 The technique of putting driveway interlocking together allows for floating of the pieces, rather than ripping and tearing. There is a choice of material, color, shape, and pattern. Potential customers are encouraged to describe what they want as nearly every choice is available. The style has enough strength to last for years. In the event a block breaks, the process for repair is relatively simple for expert installers. Are you proud of your newly designed driveway? In case oil leaks on one or two of the interlocking pavers, you can clean it quickly with special paver cleaner. Since the life expectancy is decades rather than months, that frees the money once put aside for driveway repairs. You’ll be thrilled with the look and durability of the driveway. Set the money aside once saved for repairs and use it for a walkway built with the same design. Driveway pavers range from 3 to 3-1/2 inches in thickness, while the conventional pavers used for walkways are only 2-3/8 inches thick. As the weight placed on them is far less than that placed on the driveway, they are durable, although lighter. Most homeowners are sold on the beauty and quality of the driveway after it’s put down. Real estate brokers are noting that the expensive look is extremely attractive, making interlocking pavers a status symbol in a neighborhood of traditional concrete or asphalt driveways. Why should you lose money on the sale of your home because your driveway looks boring, stained, or cracked? Walk around any urban neighborhood to get an idea of how contractors use a variety of shapes and colors to form long-lasting curb appeal. Then call for an appointment and schedule this improvement so you can have it done as soon as possible. After all, you and your family deserve the benefit of this creative work of art. If you want to save money by not replacing driveways in the future, you must be certain of some basic requirements. Verify the contractor is licensed, bonded, and insured, in case anything goes wrong. Find out about the qualifications and experience of the crew being sent out, as well as their names. An estimate is suitable before measurements and materials are selected. Ask for an actual price and a guaranteed date of completion on the contract you sign. Ask for references and a local home where installation is completed. Before signing an agreement, drive over to look at the workmanship and results. Prepare to be impressed with the driveway interlocking results. Your home and landscaping will look more appealing, adding value to the overall real estate experience. There is a great deal of information about interlocking pavers on the internet. A great source for finding out the facts is a local contractor that deals with this type of driveway and walkway material. Get ideas by reading through the colorful brochures supplied by the office. Get brief descriptions of the more complex information regarding these durable designs. This entry was posted in Decoration, Home Improvement, Outdoor and tagged Driveway, Interlocking, Interlocking Brick. Bookmark the permalink.